The race attracted than 6000 people—including about 1000 foreign runners and the prime minister of Hungary, Ferenc Gyurcsány. A very sunny morning greeted the runners on the start line in the City Park (Városliget), and they were sent on their way to the rhythm of the Batucada Samba Band. After running through Heroes' Square, the crowd rolled on to Andrássy Street. Over 250 runners came from Great Britain, 200 from Holland and 100 from Germany. There were runners from as far away as Panama, Sierra Leone and Malaysia. All of them—young and old, locals and foreigners—could admire the beauties of the Hungarian capital during their journey of two-hours or more, as they conquered the distance. The Nike-Fun-Run (3,5 km) started 15 minutes after the main event, offering a challenge for relatives, children and those who prefer the shorter distances. The hot and hazy weather made the distance hard. Ferenc Gyurcsány said right after the race: "The last six kilometres were extremely hard. But only one thing matters: I managed to do it." Afterwards hundreds of runners and their relatives stayed on in the City Park, enjoying the late summer sunshine. For the first time in ten years Brazilians took both male and female titles writes Rodolfo Eichler. Almost free of Kenyan opposition, the young Frank Caldeira won in good conditions (22°C at the start and 25°C at the finish, no wind, and 57% humidity). Marizete Rezende finished ahead of former winner Sirlene Pinho to win the women's division but Lucélia Peres had held the lead until the final 500m when she fell, and was unable to finish. The top two finishers in both categories were selected for the inaugural IAAF World Road Running Championships to be held in Hungary on 8 October. 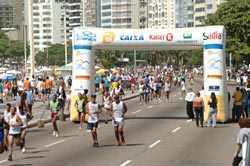 In two year's time this race will be held in Rio de Janeiro, using the course of the Rio Half Marathon. This inaugural event attracted 230 runners from 15 countries to the resort town of Victoria Falls and the race was run in near perfect conditions. Both races cross the scenic steel bridge over the narrows of the Zambezi River just below the falls which connects Zimbabwe to Zambia. They then turn around and re-cross the bridge back into Zimbabwe. The falls themselves are 1.7 km wide and over 115 metres deep. The course then followed a beautiful route along the Zambezi River, through the National Park, and then through the suburbs of the town. The half marathon finished at the local primary school, where local hotels had set up a finish with great atmosphere—and the school swimming pool was most welcome in the heat. 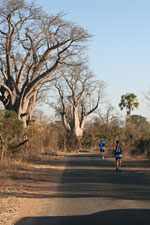 The marathon route continued along the main road towards Botswana, through a large natural teak forest, before returning to finish at the school. In the National Park section runners were treated to views of elephant, buffalo, impala and baboon, and many stopped to take photos. Runners' security was ensured by armed National Parks wardens along the route. The locals had seen nothing quite like this before and crowd support was great. It was a Sunday no one would forget for a while. Local schoolchildren flocked to talk to the top runners, earnestly asking for advice—maybe a top runner of the future was amongst them. 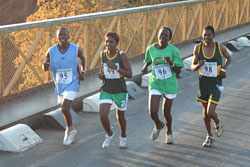 Zimbabweans took the honours in the full marathon, but Zambians scooped the men's half. A look at the times does not do credit to this course, which is run at about 1000m altitude and has some hilly sections. In the future a winning time of around 2:15 could come from this course. Adequate footwear was sadly lacking among the local runners, many running in "safari boots", gym shoes, and even barefoot. The winner, 25-year old Nkosiyazi Sibanda, ran the whole race barefoot, as did many of the others in the top 10. Addressing this need will be a priority for the organisers, who will seek support from the AIMS community. The Minister of Tourism attended, and with his support and that of the Zimbabwe and Zambian governments the race is set to grow into a major event on the running calender in Africa—it is certainly one of the most scenic places in the world to run a race. After the thunderstorm damage of last year, the weather for the 14th edition was bright and sunny. Runners saw the Eiger, Mönch and Jungfrau wherever they looked, and a lot of blue sky. The weather and the good atmosphere left runners elated at the finish line but although times were good no race-records were broken. Last year's winner Tesfaye Eticha was the only one to run under three hours. Locals Martin Ploner and Lorenz Brunner came 5th and 12th respectively. In the women's race there were four long time contenders for victory, but Simone Staicu took the title. Simone Niggli-Luder, twelve times a competitor in the Orienteering world championship, came fourth in her first attempt at the marathon. In Interlaken, 3184 men started, of whom 2994 found there way to the finish line. In the women's category, 734 women were registered, of whom 658 successfully completed. In all 3918 started and 3652 finished. 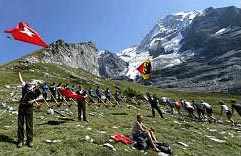 Next year's 15th Jungfrau-Marathon, on 7-8 September, incorporates the 4th World Long Distance Mountain Running Challenge. The race incorporated the Polish half marathon championships. There were 917 finishers from 11 countries. The Average International Marathon of Medellín is the pioneer of road racing in Colombia, and one of the most important in all Latin America. Medellín is a centre of fashion and of sport. The Half Marathon generates tourism and employment for the city and for Colombia. Around 3,000 schoolchildren ran the 5km Carrefour Chévere race. The school with the greatest number of runners participating earns a sports endowment for its community as part of the development programme administered by the race organisers. Around 12000 people visited the Life Sport fair in the three days preceding the race. In all, 17,875 competitors in the different categories participated in a recreational sports event and a popular carnival with great international prestige. 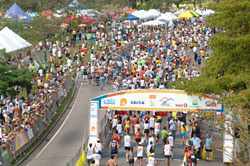 The 18th edition of the race atttracted 5000 runners, and fully half of them were foreign runners, including 1500 Brazilians. Most of the others came from Uruguay, Peru and the EU countries. Race conditions were 25°C and 60% humidity. The value of the ChampionChip timing system was reconfirmed by the tight men's finish. The Argentinian Oscar Cortinez came across the line 0.15 seconds before the Brazilian Fabio Nascimento - a veritable photo finish, except that no photo was necessary. A similar scenario in the women's race resulted in the Argentina Carina Allay imposing herself to win, by a slender margin, from the Brazilian Beatriz Nascimento. The day was sunny and warm (18-23°C) for the 1,635 runners from 25 countries who took part in 7th Hans Christian Andersen Marathon in Odense. 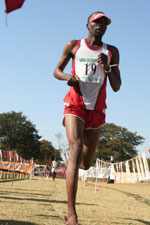 The 2004 winner, Kenya's Daniel Too, took off from Phillip Bandawe of Zimbabwe at 39km. The Danish runner Lene Duus surprised everyone by winning her first international marathon. 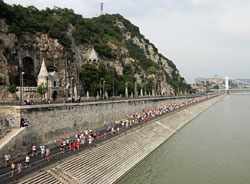 The half marathon was a women's race, believed to be the only one of its kind in the world. there were 348 participants. The passion and spirit of Bangalore was again demonstrated by the turnout of over 25,000 people for the event and by home winners in all three categories of races. A good tough field for the men's full marathon included runners from across the world including three elite Ethiopians. But just as in last year's race a local lad took up the challenge and came home victorious in the last 300m. Haile Gebrselassie long threatened the world record of 2hr 04min 55sec, set by his great rival, Paul Tergat on this same course in 2003 writes Pat Butcher. He led with pacemakers from around halfway, having dropped Sammy Korir at 20km, and he was on his own after 30km. Although he finished way ahead of the runners up, he was exactly one minute and one second behind Tergat's time, as he slowed in the final 5km. Gebrselassie set a new personal best, beating his 2:06:20 from Amsterdam a year ago, and said, "I will break the world record one day, I'm sure." There was also Ethiopian success in the women's race when Gete Wami, the 1997 10,000m world champion also broke her marathon best. Although second-placed Salina Kosgei also set a new personal best, the weather was warm, rising from 16°C at the 09:00 start, to 22.5°C at the finish. Almost 10,000 runners participated: 2300 ran in the full marathon, representing 30 countries and 41 American states (over 700 Americans took part). In a rare conjunction of continents there were also 200 British runners and over 100 Mexicans. The much-anticipated attack on the Canadian all-comers record fell short — but only by a whisker. 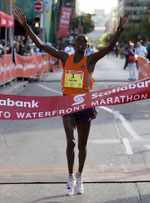 Daniel Rono took his marathon streak to three wins, as he defeated a high-quality field in challenging, windy conditions on the Toronto Waterfront. He took a minute and a half off the previous course record, set by Simon Bor last year. His time was 20 seconds short of Waldemar Cierpinski's Canadian all-comers mark of 2:09:55 set in the 1976 Olympic Marathon. It is the third fastest marathon ever run in Canada. Rono had run 2:12 twice in the last 18 months, with wins in Madrid 2005 and Mumbai 2006 (in hot conditions). After an excitable first kilometre of 2:49, a large group of more than 20 settled down, tucked in behind the four pacemakers who provided an effective windshield between 3km and 12km. They passed 10km in 30:50, and halfway on target-pace in 64:37. At this point there were still 15 in contention, including Rono, last year's winner Bor, 2006 Commonwealth Games Champion Samson Ramadhani of Tanzania, and the Moroccan Abderrahime Bouramdane, who had won in Ottawa in May, in a personal best of 2:12:18. By 25km the pacers had gone and the group was down to six. Ramadhani and Bouramdane were pushing the pace towards a likely 2:09 time. By 30km Bor had dropped off the pace with a sore calf muscle, but eventually struggling home courageously in sixth. At 33km Ramadhani paid the price for his earlier aggression, and the race was down to two, Rono and Bouramdane. Turning into the wind (gusting from 25km–30km/hr) just before 34km, the pair ran shoulder to shoulder although the pace dropped to 3:12 per kilometre and the chances of picking up the CAN$20,000 bonus for breaking 2:09:55 slipped away. At 39km Rono sensed that his opponent was tiring and made the decisive move, quickly opening up a gap of some 40m. He maintained his style even into the wind in the last kilometre, to record a very impressive winning time. Malgorzata Sobanska ran a smart tactical race to set a new women's course record. She overhauled the long-time leader Elizabeth Chemweno in the last 10km to cross the line in 2:34:31, eclipsing Lyubov Morgunova's 2:36:20 set in 2003. In the accompanying half marathon, locally-based Giitah Macharia, benefitted from the shelter of the marathon pacermakers to 18km before powering on to win in 64:37; The women's race was won impressively by Commonwealth Games marathon silver medalist, Hellen Cherono. 1  Vjatseslav KOSELEV          EST  ?????? 2  Viktors SLESARONOKS         LAT  ?????? In the three-day triple marathon, which more than circumnavigates the Lake and of which the final instalment is the Lake Tahoe Marathon, Johan Oosterhuizen put in a Guiness World-record breaking performance to run highly consistently and clock up a total time of little more than 8 hours. Thomas Reiss was not so far behind, but the women's race was closer, with Deborah Hamberlin winning by a margin of 12 minutes from Van Pham. 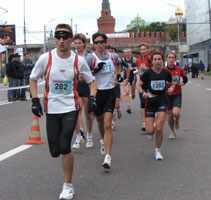 The race direction is only determined a few days before the race, so that runners are almost assured of the wind at their backs. The front runners in both races flew away from the rest, with Virginie Vanroogenbroeck finishing 12 minutes clear. A tight battle in the men's race between Rik Ceulemans and Gino Van Geyte, which resulted in a 100m win for Ceulemans, also took place a distant nine minutes before third place was claimed.